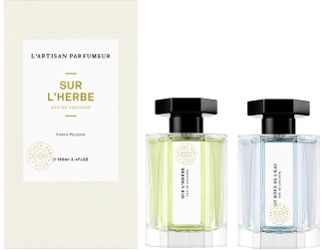 L’Artisan Parfumeur has launched Sur L'Herbe and Au Bord de L’Eau, two new colognes inspired by impressionist paintings. Both fragrances were developed by perfumer Fabrice Pellegrin. Sur L'Herbe ~ inspired by the Edouard Manet painting The Luncheon on the Grass, with amber, white musk, neroli and green notes. Au Bord de L’Eau ~ inspired by Claude Monet's On the Bank of the Seine, with bergamot, lemon, violet, musk, orange blossom and rosemary. L’Artisan Parfumeur Sur L'Herbe and Au Bord de L’Eau are available now at Selfridges in the UK, £90 for 100 ml Eau de Cologne. Hmmm. I’m intrigued by Au Bord de L’Eau, mainly because I love violet and musk, am curious about the rosemary, and I really want to be inside that painting. I will try them both when I can, but admittedly not all that excited, couldn’t say exactly why. Agree! Of the two I would choose Au Bord de L’Eau over Sur L’Herbe for the fragrance notes and the painting.